If you don't know much about the different species of bee's we recommend you read till the end to see the stunning photos of the different bees that have so far enjoyed the garden. We have labelled them up for you! Enjoy! Who are the Bee Garden? For the past five years the Bee Garden Project, a group of canal enthusiasts and volunteers from the Inland Waterways Association of Ireland headed up by Heather Crawford, have transformed a patch of overgrown and weed infested land beside the Newry Canal in Northern Ireland into an attractive haven for wild bees. 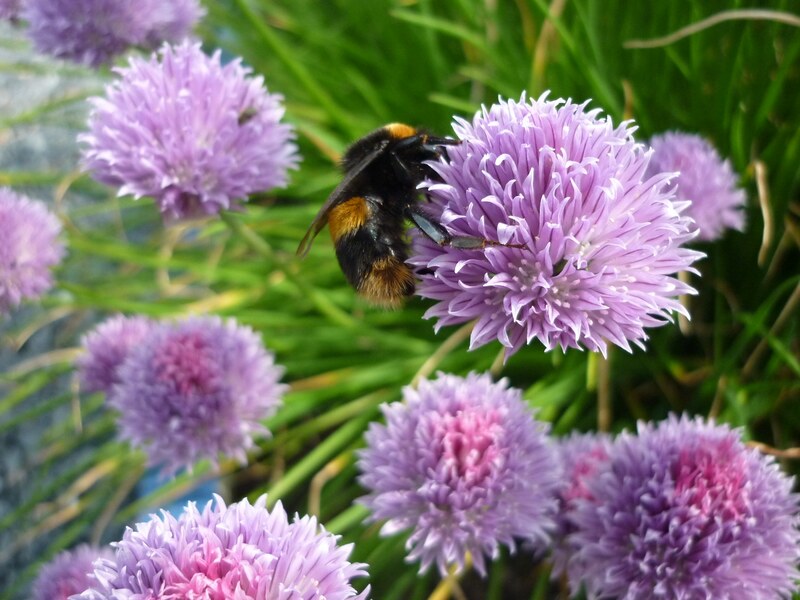 The Bee Garden has been recognised by the National Biodiversity Data Centre of Ireland and has been referenced as a brilliant example for anyone looking to start a similar pollinator project. Our aim is to prove you can have a beautiful space without spending money, so we try to only use the things we have, and buy as a last resort. 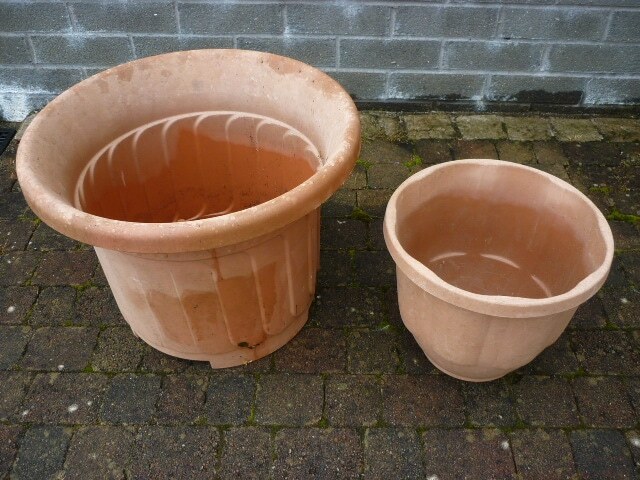 Other gardeners in the area have been amazing at donating us propagate plants, cuttings, beg root divisions and seeds. 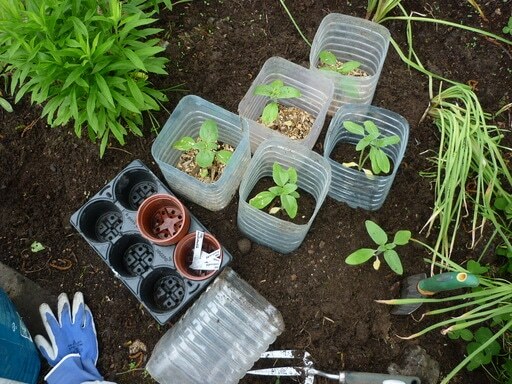 Unfortunately unlike the rest of the UK Northern Ireland has experienced some pretty damp conditions and we've found the only way the protect the sunflowers from slugs is to plant them like this (see photos). For more natural slug controls click this link. Rings cut from 5lt plastic water bottles, a mulch of chippings and a light scattering of organic slug pellets. We sow wildflower seeds in this way, too, so that we remember where they are and don’t get stood on, we pop a ring around transplanted plants. 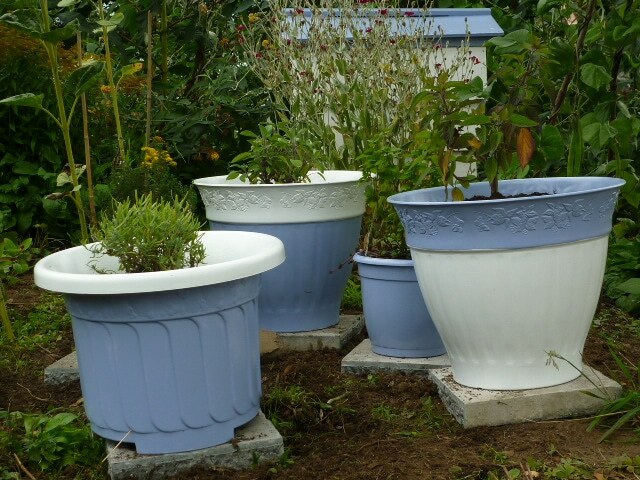 We also upcycle tubs. The series of photos go from when we first got them through to how they look this week, planted with everlasting sweet pea, thyme, sage, lavender with poppy seeds and corn cockle. They now sit on a bed of salvaged quarry dust, edged with discarded timber on an area of very poor, dumped soil which wouldn't support much plant life in the garden. The project has given some older members, who are no longer able to join in with the heavy canal work, a way to participate in the restoration. It has transformed Moneypenny’s Lock into an attractive spectacle for the local community and anyone using the towpath. It has become a great way for people to have fun and socialize in the fresh air, with members coming from all over County Armagh. The project has shown visitors that you don’t need a big budget to grow useful and beautiful plants. The different type of Bees in the garden! These are all types of bumblebees, numbered from left to right. 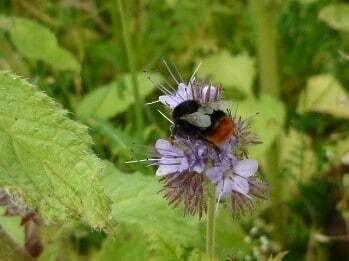 2) Common carder bumblebee on chive. 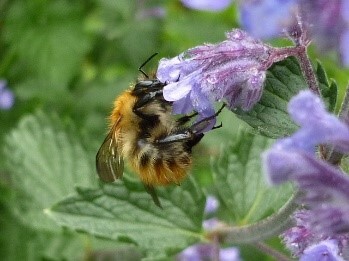 4) Common carder on wet borage. 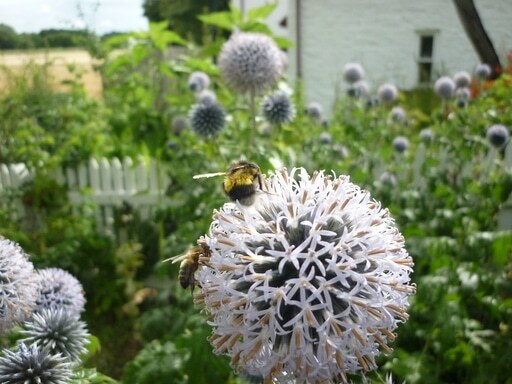 5) Honey bee and white tail bumblebee on echinops. 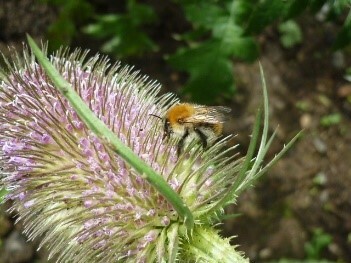 If you want to garden for bumble bees provide early flowering nectar sources for queen bees coming out of hibernation. (They go into hibernation around October time). If the queens don't survive then there won't be any worker bees to pollinate our gardens and crops. We've found that the two best plants are Pulmonaria and Bugle, neither of which are expensive perennials and both of which grow easily and can be divided and spread around the garden. If you want to sow seeds with children, Borage is one of the best and most useful to bumblebees because the flowers fill up with nectar again very quickly after a bee has visited. The seeds are big and easy for children to see and handle. 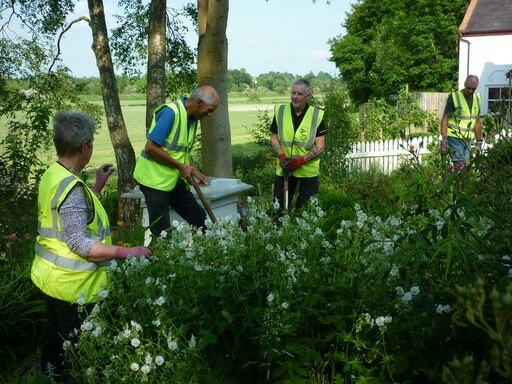 With volunteer numbers decreasing, the garden will have to be rearranged to suit fewer helpers and make it easier to maintain, however this should not deter the bees from visiting and new volunteers are always welcome. Future projects include; the laying of new paths to replace the old stepping stones, edging to stop soil slip on the slopes and mulching, to help cut down on weeding. How you can help the bees! Plant bee-friendly flowers that are rich in nectar in your garden or if you live in a town or city, use a window box. Wildflowers are easy to grow and look after and bees love them. Make a bee hotel using stacks of dry, untreated logs, timber and hollow plant stems. 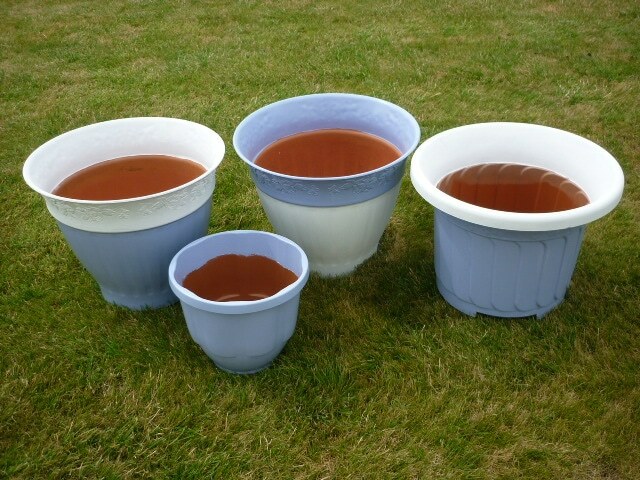 This will give solitary bees, of which there are over 200 species in the UK, a place to nest. Choose local honey from sustainable local bee keepers and farms, as this will help beekeepers look after their hives and protect their colonies. Spread the word, support the cause and don’t forget to encourage your friends and neighbours to do the same. 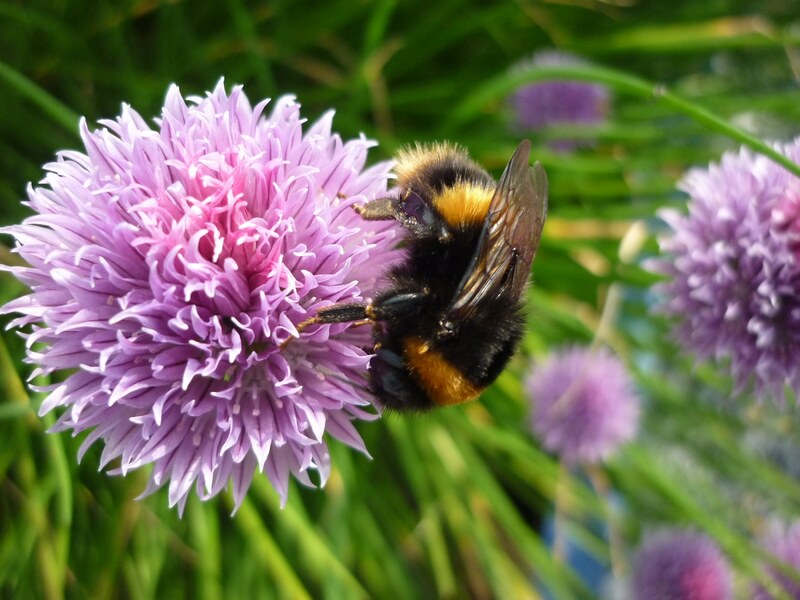 A list of the top 10 bee-friendly plants can be found here.